From the inside flap: "Chloe's older sister, Ruby, is the girl everyone looks to and longs for, who can't be captured or caged. When a night with Ruby's friends goes horribly wrong and Chloe discovers the dead body of her classmate London Hayes left floating in the reservoir, Chloe is sent away from town and away from Ruby. But Ruby will do anything to get her sister back, and when Chloe returns to town two years later, deadly surprises await. As Chloe flirts with the truth that Ruby has hidden deeply away, the fragile line between life and death is redrawn by the complex bonds of sisterhood." 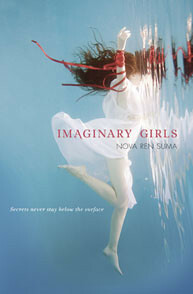 Reading Imaginary Girls is like walking through the halls of a haunted house. Everything on the outside is normal, but strange things happen from time to time and you can't be sure whether the ghosts are real or if its just your mind playing tricks. Events in the book are subtly strange in this way, and the surreal tone of the tale is entirely appropriate, because hauntings abound. The lost town of Olive haunts the bottom of the reservoir, Chloe is haunted by the memory of the dead girl, Ruby is haunted by the secrets she tries to hide. The title is also wonderfully appropriate, as the uncertainty of what is imagined and what isn't unfolds throughout the story. Not to mention, what makes a girl imaginary? Is Chloe imaginary because she isn't entirely her own, because she's possessed by Ruby (and willingly so, as she offers her devotion wholeheartedly to her sister)? Is Ruby imaginary, because how can that kind of girl, the kind of girl that gets everything and anything she wants really exist? Or is the imaginary part of Ruby dependent on how Chloe sees her, how Chloe idolizes her and in a way shapes her with that idolatry that no person can live up to? And London? Oh, there are many, many ways that London could be imaginary, if she exists at all. Imaginary Girls is a book that is multilayered and achingly beautiful, one that leaves just the right amount of questions for you to sit with on rainy Sunday and ponder, while outside the water swirls. It's a book I want to hold in the hollows of my heart and never, ever let go. It's also one of those books I want to see made into a movie right now, damnit, now. In fact, as soon as I put the book down, I began to imagine how I would adapt the screenplay and shape the work into a finished film.It would a be a difficult book to adapt, due to its subtly and Hollywood has a tendency to want things clearly explained, especially in movies geared toward young adults. No doubt the immediate inclination of any screenwriter would be to use voice over. I can understand the temptation, as it would allow Chloe share the inner workings of her emotional state. Color would be a vital part of this movie, reds would be too red, blues too blue, but all or most of the color would be for the girls, especially Ruby, who's eyes would be the most green thing in all the movie. The rest of the town, compared to Ruby (and at points Chloe, too) would be gray and brown, dull in comparison. Ruby, too, would appear subtly sharper, more in focus, than everything and everyone around her. The cinematic tone in the town where Ruby rules would be different than everywhere outside of town or when Ruby is not in the scene. Light would also play a large part, especially at night, when shadows have greater impact and the reservoir (a character in and of itself) would be inky black, like oil. It would lick at the shore, it would seem to reach up around the edges. Sometimes the reservoir would reflect the starlight with perfect clarity, so it looks like Chloe is swiming in the sky, sometimes it would reflect nothing at all. People who come to see the movie should leave at the end feeling joyfully unsettled, as though they had just walked into amd experienced someone else's dream.